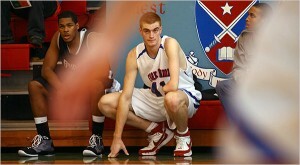 Kevin Laue, a one-handed basketball player, is on his way towards achieving his dream of playing N.C.A.A. Division I basketball. Laue has accepted a scholarship to play for the Manhattan College Jaspers next season, and told The New York Times that he’s looking forward to making a difference, while of course, playing some ball. When Laue was born, the circulation to his left arm was cut off by the umbilical cord, stunting its growth. But the rest of his body grew quickly. The 6-foot-10 center played basketball at Amador Valley High School in Pleasanton, Calif., but a broken lag dashed his hopes of getting a scholarship offer. Instead, he attended the postgraduate program at Fork Union Military Academy in Virginia, a school that has graduated many professional athletes, including Heisman Trophy winners Vinny Testaverde and Eddie George. Watching his videos on YouTube are impressive, and many others seem to agree. Fans’ comments include “totally cool,” “an inpsiration,” and “he’s better than two-handed players.” The world will be seeing more more of Laue as sports media follows his unique playing techniques and superstar potential.